Click photo for larger view! Letter of appreciation to Captain Shumake from Systems Development Corporation. "Airman First Class Trent Bailey, Weapons Controller Technician at 26th NORAD Region/Air Division points out a target for Airman Toni Bailey, a Air Surveillance Operator new to SAGE Operations, who is also his spouse." Picture was taken on February 12th, 1975 for an article in the Division's newsletter. 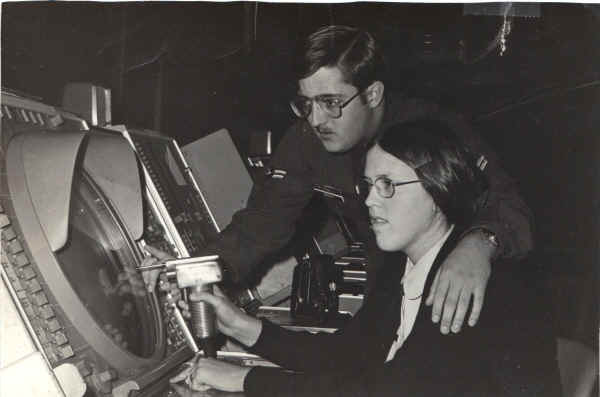 As I recall, there were 3 couples that worked together in the 26th Air Division and two of them were stationed at the NORAD Region Control Center at Luke AFB, AZ. Trent Bailey tells us "The 26AD crest is actually printed on adhesive-backed paper and was used to mark manuals, books, etc. I remember a sheet of them had a huge one, like 8X10, then smaller ones, down to an inch high. This is an 3" original from there, and I've had it since my days there. Yellowed with age, it is stuck to a mirror on my workstation at home." SSGT. DAVID LAZOK and CMSgt. Ben Greene check out the IBM 718 printer. - SSGT. KENNETH WHITE: and SSgt. Ronald Kareiva make a daily check on a magnetic drum. SSgt. JAMBS THOMAS makes some switch settings on the Computer maintenance console. SSGT. DAVID LAZOK works on the IBM 718 printer. SGT. ROYAL PRENTICE performs a check on a Plugable Unit in the maintenance and test lab of the computer complex. A few months ago, a team of photographers from Scientific American Inc. visited the computer complex at the 26th Air Division headquarters. They took two days of movies in the complex, and must have shot the computer and its display console from every angle imaginable. They were interested in the machinery at the Region Control Center because their story was on vacuum tubes, and the AN /FSQ-7 computer at Luke is one of the only computer systems in existence that still uses the old tubes. The computer complex, which encompasses most of the ground floor area in the SAGE building, is the nerve center of the region. This computer takes inputs from each 26th Air Division unit and feeds the information to the display consoles used by the ground controllers. The AN /FSQ-7 computer system is virtually the last major tube-type com­ puter system in existence. All of today's modern computers are much smaller and use transistors. The vacuum tubes in the SAGE computer give a "science fiction" effect in their fascinating array of colorful blinking lights. It is a system much like this that many film makers have adopted for television serials and movies; most notably Star Trek and Voyage to the Bottom of the Sea. Because of the age of the computer and its vast network of vacuum tubes, a tube that has the life span of a normal television tube, the division has a crew of 32 maintenance men working day and night to keep this vital piece of ma­ chinery 'working. The computer maintenance section is under the. auspices 1st Lt. Tony Kozlik, section chief and CMSgt. Ben Greene, NCOIC. Their section maintains not only both Q-7 computers, but also 136 display consoles used within the headquarters building. "Due to the tube-type computers we have, our major job is preventive maintenance," explains Lieutenant Kozlik. "This entails removing circuits before they fail by using the marginal checking system every day." Preventive maintenance is divided into three specific areas; 1) central computer; 2) input/ output equipment; and 3) display equipment. "A man is trained and works in only one of these three areas," explains Sergeant Greene, "because there is so much to learn in each area. Very few people understand two or more of the areas, and for this reason our men must specialize." Depending on a man's prior experience and training it usually takes a man an average of six months before he learns his entire job and becomes productive. Most of the computer maintenance work is done after normal daytime working hours when the computer is avail­ able. Any faulty equipment found during the normal daily checks is repaired by the maintenance men themselves. I was an Electronics Installation Team Chief, working for USAF out of Norton AFB, CA and assigned to the 1835 EIS (Electronics Installation Squadron). One of my assignments was to Luke AFB, AZ to remove (scrap) the AN/FSQ7 computer from the SAGE building. At some point I was told that it was the last active FSQ7 in the Air Force inventory; but I never had proof of this fact. We scheduled our arrival only after extensive prep work was done to turn off the power sources to the equipment and the equipment had been harvested for precious metals. All we really had to do, as I recall, was to cut away all connectors and unbolt the major components and take them out of the structure. The first week we ripped into it. I mean, we got permission to disassemble 14inch metal chop saws from the stands and use them “free-hand” to cut the 4inch armored power cables from up in the cable racks. The overhead cable racks themselves were the most extensive I had encountered to that time, with three levels of racking. We were flying around like monkeys up in those racks. We would cut a cable at a strategic point where it ran down some racking for perhaps 100 feet. Where the cable dropped to floor level a couple team members would pull on it and the steel cable cover would start to slide over the racking. Slowly it would pick up speed. The weight of the cable would cause it to keep accelerating until it shot out of the rack and hit the floor with a boom! That was lots of fun. The cut pieces could then be maneuvered into metal mini dumpsters where a forklift would pick it up and haul it out to the parking lot. I got some ideas for a comic while this was unfolding. The parking lot out back was where everything ended up. That’s when I saw these trays of ferrite memory . They were either nine or 16 panels to a tray. Anyways, I asked for permission to keep one or two of the trays, as I could see that the panels could be separated and would make interesting souvenirs for my team (any one who wanted one). We did the job in record time. I took black and white photos so that the base paper at Norton AFB could publish an article. I had the byline. I remembered the article because it used my picture of our team member sawing through the cables with that 14inch metal chop saw, full face shield and sparks flying! In the group picture, if enlarged, you can clearly see the racks of computer parts with the cables cut off at the top behind the group. Back at Norton AFB, I desoldered the individual memory plates from the flat plane that held them. Then I poured some art epoxy that is used to cover wood tables inside of the delicate ferrite bead weaving. When it set up you could see all the beads and wires, and didn’t have to worry about breaking the hair-like wire and bead assembly. I also drew a cartoon to remember our escapade. Somehow, I knew this was a special TDY assignment. For what it is worth, I have scanned the comic, two photos, and the letter from the commander, Det 2, 26 AD. Note that the new 26 AD had been moved to March AFB, CA by this time. Brian Wilson needs to modify our current service request being used. a. They are adding a box for tax status. b. adding a box for additional technician. My first recommendation is delete the parts block and utilize this space for work performed/parts used. 2nd recommendation is that a maximum of two additional techs should suffice; I think four is a waster of space. Please put your two cents in; Brian Wilson TSM would like to know; even if you like it as it stands. How many knights, or in this case airmen, does it take to kill a giant? When the 26th Air Division shut down its giant computer Clyde, Dec. 22, it only took the flip of three switches to stop the mighty soul of the beast that's been running for more than 23 years. But, now that it's no longer needed, what do you do with a huge hulk of early 50s technology? Unfortunately, most of the computer will end up in the junk yard. Parts that can be reclaimed, such as copper wire, are being stripped out of the computer and visual display consoles. There were nearly 450 tons of tubes and hardware in Clyde. More than 32 million separate parts and wire that would stretch from Luke to Tucson and back with 22 miles left over made up the computer. More than $1.5 million worth of precious metals were inside of Clyde. They included 1,400 ounces of gold and 19,300 ounces of sliver. Platinum and lead were also used. These metals will be sold to recycling dealers, with the money going back into the Air Force budget. Computer technicians and weapons controller technicians that are still assigned to the blockhouse are breaking down Clyde, piece by piece. months to completely gut the computer operations and air surveillance sections of the building. Clyde was the last of an extinct breed of computers. He was a first generation IBM computer. The military designation for him was a AN-FSQ-8, vacuum tube type computer. When he was first put to work in February 1961, Clyde cost a total of $32 million. He could handle 64,000 computations per second. Today, many desk top computers sold in department stores can work the same load. Clyde is gone but not forgotten. There are consoles and parts of frames in the Smithsonian Institution in Washington and the IBM headquarters in New York City to keep his memory alive. MSgt. Robert Porras pulls apart the gold-plated memory core rings with a screwdriver. Before removing tubes and tube racks TSgt Earl B Pate power drills out screws holding tie rack handles. Everyday we rescue items you see on these pages! What do you have hiding in a closet or garage? What could you add to the museum displays or the library? DONATE! Click the Button Below! Let us know what needs preserving!